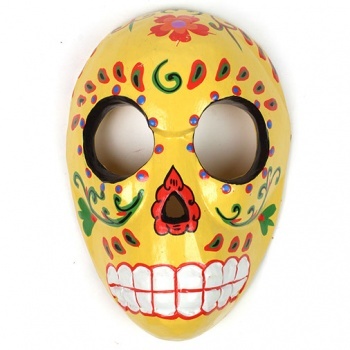 Brightly coloured wooden masks decorated in a style reminiscent of candy skulls which are made to celebrate Día de Muertos, the Mexican Day of the Dead festival. During this festival, family members and friends gather together to celebrate the lives of lost ones. The origins of these skulls can be traced all the way back to the Aztecs. They are known colloquially as 'calacas' in Mexican Spanish and are often displayed with flowers and foliage and are usually depicted in a joyous manner with bright colours. Our skulls are inspired by this Mexican tradition and are handmade and painted in Bali by skilled artisans.